atxGALS and Native Hostel partner to bring you an art party that's not to be missed! Join us for atxGALS’ official Fall art party highlighting some of Austin’s most talented emerging female artists. Following their model of creating unique art exhibits to change the way people engage with fine art and creators, atxGALS and Native Hostel work together to bring you a night of music, drinks, and amazing art. 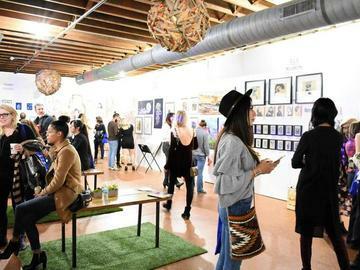 The night will kick off at 6pm with an exclusive meet and greet with the artists, open bar, passed around chef-prepared appetizers, and an exhibit with works from over 10 local female artists. The party will continue at 7:30 when doors open to VIP and General Admission guests. As usual, atxGALS is expected to put on an incredible event, and in partnership with Native Hostel, will have two DJ sets, swag bags for the first 100 VIP ticket buyers, and a silent auction benefiting Girls Empowerment Network. No refunds. Event is 21+ only.